Hip replacement is among the most commonly performed orthopedic procedures, and the results are excellent. Over 90% of patients have excellent pain relief and improved ability to perform routine daily activities. Because of the success of hip replacement surgery, this procedure is being performed in younger and younger patients. The problem is that hip replacements wear out over time. The average hip replacement lasts about 25 years–some longer, some shorter. However, hip replacements are known to wear out more quickly in younger, more active patients. When a hip replacement wears out, a repeat hip replacement, or revision hip replacement, must be performed. Unfortunately, revision hip replacement surgeries are more complicated, and the results of surgery are not as good. Because of this, orthopedists make every effort to delay hip replacement until an age where the hip implant will hopefully last the patient’s lifetime. Obviously, no one can accurately predict exactly how long a hip replacement will last. But we do know that hip replacements tend to wear out fastest in young patients. Because of this, new developments in types of hip implants are constantly being investigated. Ceramic hip replacements are among the new prosthesis types being implanted into some patients. Ceramic hip implants are thought by some orthopedic surgeons to have superior abilities to withstand wearing over time. Ceramic hip replacements have been developed in an effort to decrease the wearing out of hip implants. Ceramic hip replacment implants are very hard, and very smooth. These characteristics could help to decrease the amount of wear within the implants. In the traditional metal and plastic hip replacements, the plastic wears out slowly over time. As the plastic wears out, small particles of plastic debris are generated. This plastic debris triggers a response by your body which can lead to loosening of the implants over time. Plastic wear is quite slow–an average of 0.1 millimeters each year! However, even this tiny amount of wear generates millions of particles of wear debris. In the ceramic hip replacements, the amount of wear is a small fraction of this amount. By generating less wear debris, the hope is that hip replacements would not loosen as quickly. Total hip replacement surgery is among the most successful procedures performed by orthopedic surgeons. Patients with severe hip arthritis, hip osteonecrosis, or other complex hip problems, can have excellent outcomes when treated with hip replacement. Long-term studies have demonstrated excellent outcomes. About 90% of patients still have their hip replacement working well after 10 years, and about 80% of patients still have a functioning hip replacement after 20 years. Orthopedic surgeons are constantly looking for ways to improve the length of time a hip replacement will last. Because of the low wear rates of ceramic hip replacement implants, surgeons hope these implants will last longer than the traditional metal and plastic implants. The problem is, there are no long-term studies evaluating the newest ceramic hip replacements. No one knows for sure how well these hip implants will perform over time. Furthermore, the metal and plastic implants are known to work very well, and have an excellent track record. While the ceramic hip replacements may be better, there is little proof to support that idea. Ceramic hip replacements are an attractive new development in orthopedic surgery. The implants address some of the problems with traditional hip replacements. The newest ceramic hip replacement implants do not wear nearly as much as metal and plastic implants. Because the amount of wear of a hip replacement is related to loosening of the implant over time, wear reduction is among the most researched topics in orthopedics. When a hip replacement loosens, a revision hip replacement may be required. Because revision hip replacements tend to be not as successful as first-time hip replacements, new technology is being developed to prevent loosening. Ceramic hip replacements look to be a reasonable option for patients who may be at risk for wearing out of the hip implant. 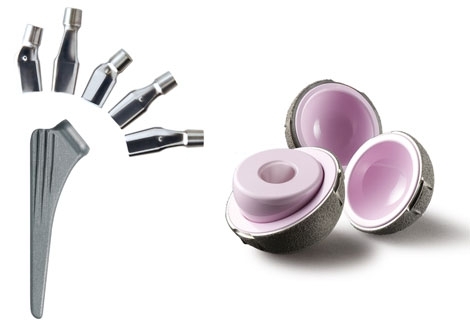 Patients who are in their 40s and 50s may benefit from these ceramic hip replacements. Ceramic hip replacement implants have functioned very well in laboratory studies and short-term human investigations. However, they are not perfect, and no one knows how well they work 10, 20, or 30 years after they have been implanted. Because the ceramic hip replacement material is hard and brittle, it can crack, much like a ceramic dish dropped on a tile floor. This used to be more of a problem, and newer ceramic hip replacement implants have been much better. However, the issue of catastrophic failure is still a concern to many physicians. A ceramic hip replacement can be considered somewhat of an ‘educated gamble.’ We know that ceramic hip replacements function as though they may be superior to metal and plastic implants, but we do not know that. For most patients, a ceramic hip replacement may not be worth that risk. The metal and plastic implants work perfectly for the vast majority of patients. Ceramic hip replacements probably only warrant consideration is young patients who may develop complications from wearing out of the implant. The history of medicine, including orthopedic surgery, is full of ‘new developments’ that are intended to fix the problems of the past. Some of these work out, some don’t. Ceramic hip replacements have been designed to address a common problem in hip replacement surgery: hip implants wear out, especially in younger patients, over time. The science behind ceramic hip replacements is excellent. The ceramic hip replacement implants have better wear characteristics, and probably will last longer than metal and plastic implants. Unfortunately, some problems with ceramic hip replacements include the issue of catastrophic failure and the lack of long-term use in human studies. Someday we will know with certainty whether or not ceramic hip replacements are better than metal and plastic implants, but we do not know that now. Some patients, especially younger patients in their 40s and 50s, may elect to undergo a ceramic hip replacement with the hope that these implants will prove to be better. We’re a bunch of volunteers and opening a new scheme in our community. Your web site provided us with helpful information to paintings on. You’ve done a formidable job and our whole group will probably be thankful to you.